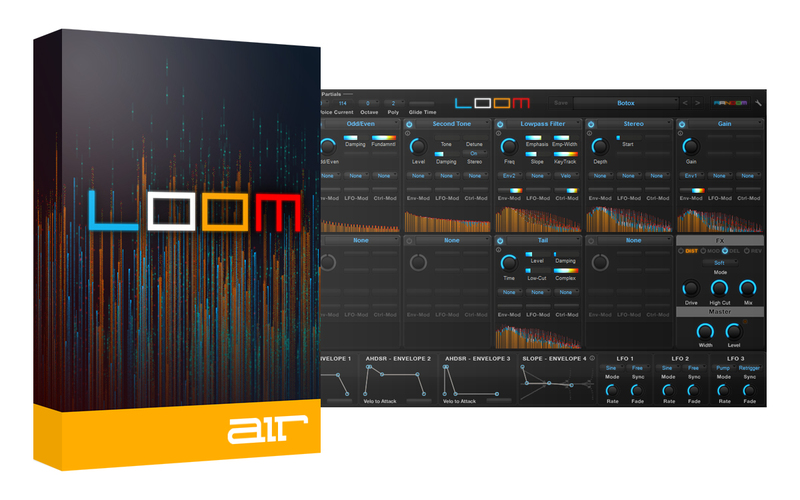 Loom allows up to 512 harmonic partials per patch and uses an intuitive modular design to create complex sounds quickly and easily. Each of the 30 editable modules performs a specific sonic task—Octaver, Second Tone, Moving Filter, Noise, Linear Lowpass, Modulator, etc. 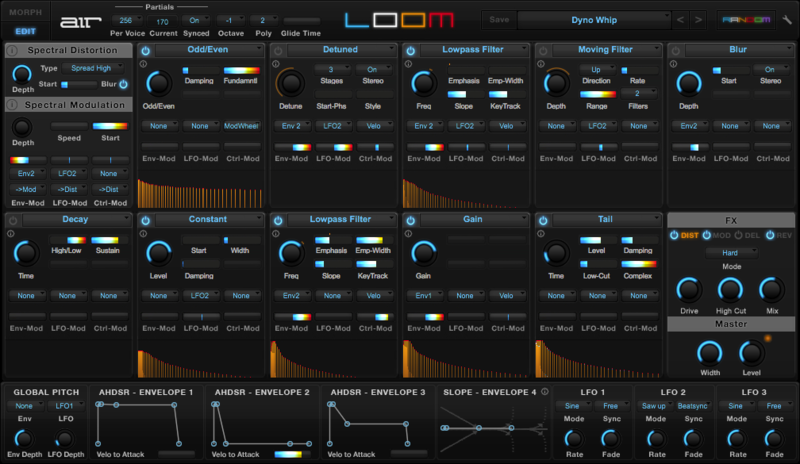 The Loom framework provides a series of cells, where up to 10 of these modules can interact and be combined to generate an additive synthesis patch. Each module includes task-specific parameters for detailed, individual control of the patch. For real-time visual feedback of your sound, each module includes a spectrum window, offering a visual indication of how that module is affecting the individual harmonics of the sound. 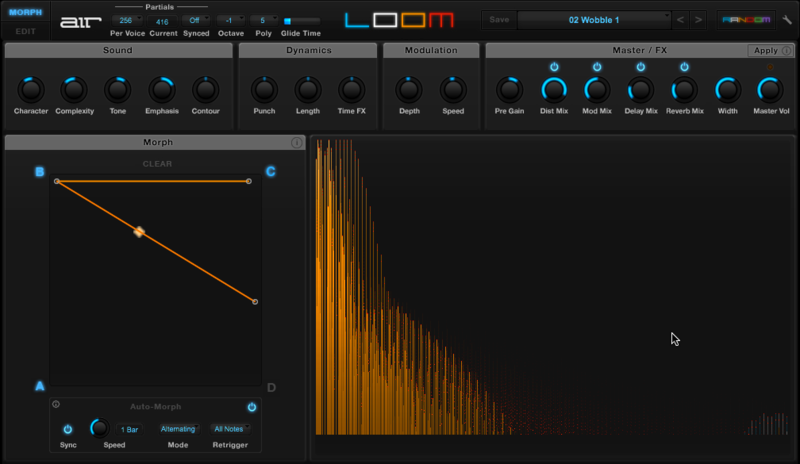 Loom’s Morph Pad is a powerful tool that adds dynamics and movement to your patches. 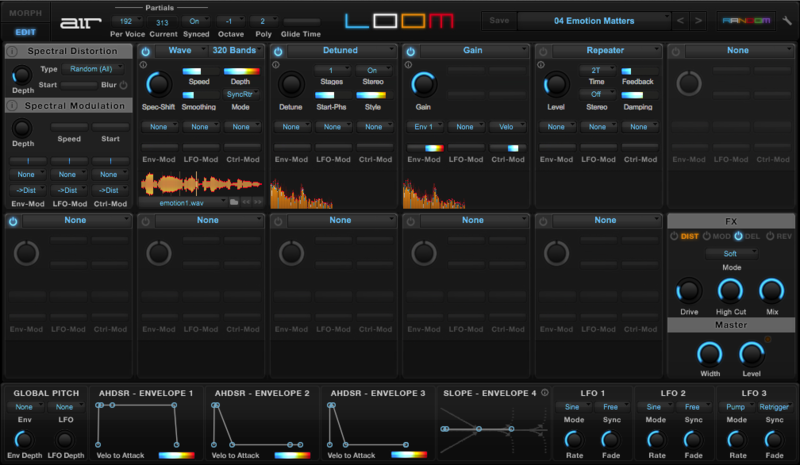 Using a condensed set of control knobs, Loom allows you to quickly create up to four variations of your sound, and assign each one to different quadrant of the Morph Pad. Point, click, and drag anywhere on the Morph Pad to create a morph path. As the sound moves along this patch, you will here it morph in real time between your four variations. This morphing can be free form, or set to sync up to a particular musical unit—1 bar, 4 bars, etc. Plus, each segment of the morph path can be synced individually. Loom comes packed with sounds. Acclaimed sound designers Richard Devine and Mark Ovenden have created 350+ professional, tweakable patches that include wobbles, pads, bass, soundscapes, and more. You can tweak, analyze, and customize their sounds to make them your own, or dig deep and begin creating your own additive sounds from scratch. 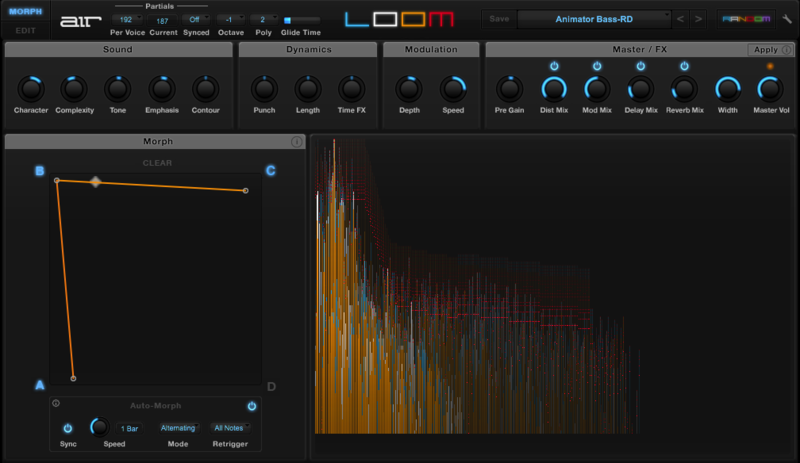 For sonic inspiration, Loom’s Smart Sound Randomizer instantly generates new parameters—or a new mix of modules—to jump-start your sound design sessions. All parameters can be mapped for MIDI control. 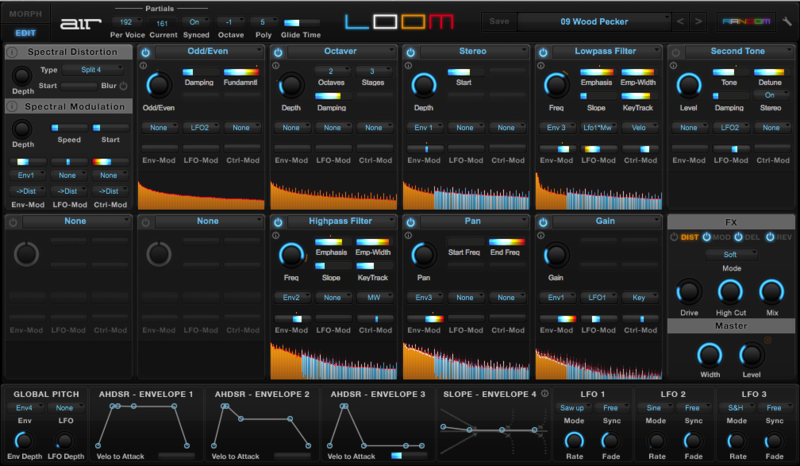 Each Loom patch begins with editable Spectral Distortion and Spectral Modulation controls that influence the overall sound. Three LFOs provide tempo sync-able modulation sources that any module can access. Four velocity-sensitive Envelope Generators add an extra layer of control that can change and evolve over time. Octave control, global pitch, glide time, and other patch-specific controls offer additional tools for your custom sound-shaping experience. Onboard effects add extra expression to your customized additive sound creations. Using the drive or distortion on an additive sound can produce an aggressive edge or introduce rich harmonic changes. Modulation effects include a chorus and a phaser. Each can add remarkable depth and motion to your sound. 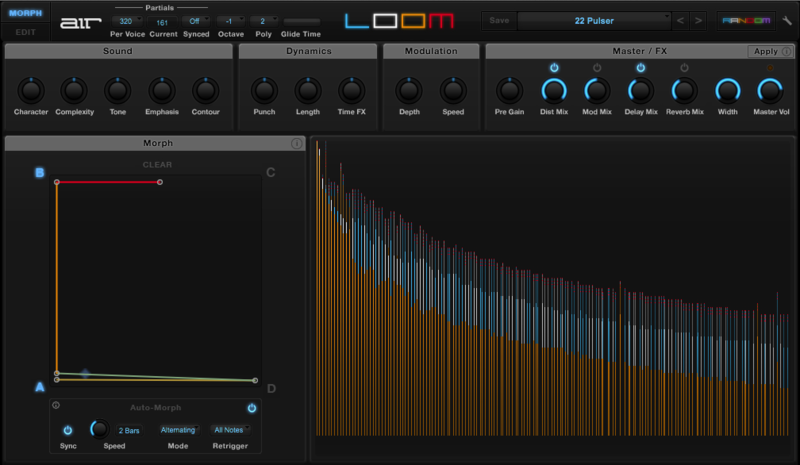 Loom also includes a reverb effect to help your sound sit in the mix, or to create an expansive audio environment.